Our courses are approved by the Alaska Division of Corporations, Business and Professional Licensing to satisfy your electrician continuing education requirements. You can find us on the Approved Courses list as "@ 1 Attempt" (Sponsor #15061). Complete the continuing education to renew your AK electrician's license today. All of our courses can be completed At Your Pace Online to help you meet the state's requirements to maintain your license. Once you finish your class you will get an official certificate of completion to save for your records. Electrical Journeymen must obtain 16 hours of continuing education every two years for license renewal. At least 8 of these hours must cover the current edition of the NEC. The other 8 hours can be 'Industry Related' or more code updates. Electrical Administrators are required to complete 8 hours of continuing education every two years, all of which must cover NEC Code Updates. This course is made up of 16 hours of continuing education content. The course covers the 2017 revisions made to Chapters 1-5 & 7 of the NEC and has been approved by the State of Alaska. This 2 hour course covers changes made to Chapter 3 of the 2017 NEC. 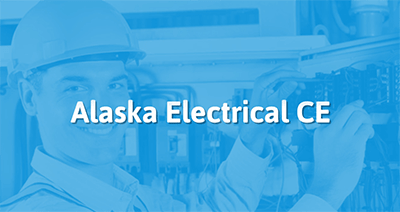 The course is designed to help electricians in Alaska meet their continuing education requirements. The course has been approved by the State of Alaska and it reviews the code that talks about wiring methods and materials. I am pleased to inform you that the Division of Corporations, Business and Professional Licensing has approved the course listed below for continuing education for Electrical Administrators and/or Electrical Journeymen. (Department of Labor & Workforce Development). Electrical administrators in the state of Alaska are required to obtain eight hours of NEC and/or eight hours of NESC continuing education depending upon their license category, every two years, based on the current state adopted codes or their later revisions. Electrical Journeymen in the State of Alaska are required to obtain sixteen hours of continuing education every two years, of which at least eight hours must be comprehensive NEC code or NEC code updates and eight hours may be "industry related".